Transit workshop Mobilidade Curitiba explored sustainable urban mobility solutions for the Brazilian capital of Curitiba. Photo by EMBARQ. 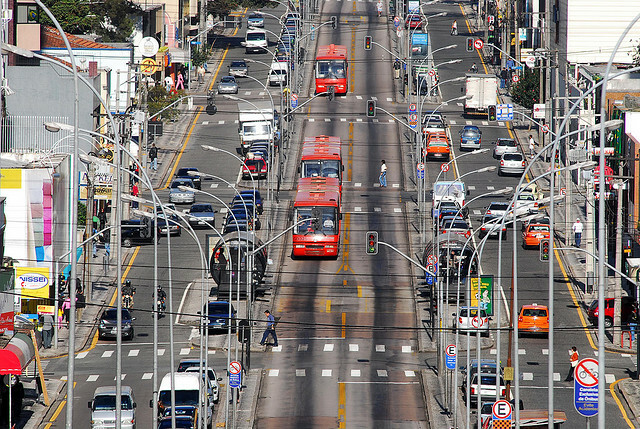 The Latin American Association for Integrated Transport and Bus Rapid Transit (SIBRT) hosted Mobilidade Curitiba, a transport workshop exploring the urban mobility of Curitiba, Brazil, on Wednesday. The city of Detroit is pursuing a bike sharing system, with near-term plans to create a system design, identity, station, shelter and bicycle. In a study investigating the demographics of pedestrians, Transport for London found that women walk more than men, younger people (20 to 40 years of age) walk more than older people, and single people walk more than those in relationships. IETT Metrobus lines will be transferred to the private sector, operating under the authority of the Istanbul Bus Company of Istanbul Metropolitan Municipality. IETT Metrobus bus rapid transit system (BRT) currently includes 43 kilometers of transit lines and 33 stations. A recent roadmap framing workshop performed by EMBARQ Brasil (the Brazil center of EMBARQ, the producer of this blog) solidified a timeline for Transoeste—the first BRT corridor in Rio de Janeiro, Brazil. It is expected to be partially operational by May 2012. TransForm recently launched GreenTRIP, a new certification program for the integration of sustainable transportation into community development. San Francisco is implementing the first parking space price adjustments to its demand-based parking space pricing system. The Clean Air Initiative for Asian Cities (CAI-Asia) released a study benchmarking the pedestrian infrastructure of six Indian cities, with the intent to inform non-motorized mobility development in India. The University of Michigan will receive a US$250,000 grant from the Alcoa Foundation to fund its Sustainable Mobility and Accessibility Research and Transformation (SMART) program. The global production of biofuels increased by 17 percent in 2010, reaching a record high of 105 billion liters. The European Commission launched a public consultation on strategies to end the E.U.’s transport sector oil dependency, as a part of its Clean Transport Systems (CTS) initiative. Massachusetts Institute of Technology researchers developed a new air quality model that simulates the various effects of highly reactive air pollutants in urban areas. Siemens and Volvo began a partnership to develop electronic vehicle technology, which will include electronic drive technology, power electronics and charging technology. The introduction of 20 miles per hour traffic speed zones in London was associated with a 41.9 percent reduction in road casualties. Washington, D.C. was deemed the city with the worst drivers in the United States, as determined by a study from the U.S. insurance company Allstate. The state of Texas this week increased its highway speed limit to 85 miles per hour. It is still being determined which state highways will be able to safely employ this new rule. The transit map created by Capital Metro Transit in Austin, Texas won first prize in the American Public Transportation Association’s AdWheel competition. AdWheel Awards acknowledge top work in transit marketing and communications. Quick response (QR) codes linking users to route and schedule information via mobile devices were added to light rail stations, park and rides, and transit centers throughout the Greater Cleveland Regional Transit Authority in Ohio. The Institute of Urban Transport, in partnership with EMBARQ, hosted a workshop, “Talking Transit: Marking and Communications for Public Transportation” in Jaipur, India this week, showcasing best practices to help attract more customers to India’s urban mass transit. Bicycling to large sporting events has caught on in the Pacific Northwest of the United States, as exhibited by Sounders Football Club fans in Seattle, and the Bike to Blazers program in Portland, Ore. Tags: alternative energy, Asia, Austin, Bay Area, bike-sharing, Biofuels, Brazil, bus rapid transit (BRT), cars, Curitiba, cycling, demographics, Detroit, electric vehicles, EMBARQ Brasil, Europe, European Commission, european union, India, istanbul, Jaipur, London, mass transport, Metrobus, North America, parking prices, pedestrian infrastructure, pedestrians, Portland, Rio de Janeiro, San Francisco, Seattle, Siemens, South America, speed limit, TheCityFix Picks, transit maps, Transoeste, Transport for London, Turkey, United Kingdom, United States, walking, Washington, D.C.